"Victor III" redirects here. It is not to be confused with Victor III, Bishop of Chur. 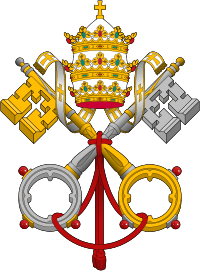 Desiderius had been appointed papal vicar for Campania, Apulia, Calabria and the Principality of Beneventum with special powers for the reform of monasteries. 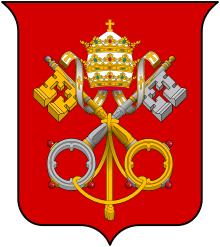 So great was his reputation with the Holy See that he "...was allowed by the Roman Pontiff to appoint Bishops and Abbots from among his [Benedictine] brethren in whatever churches or monasteries he desired, of those that had lost their patron". Under pressure from Prince Jordan I of Capua, to whom he had also rendered important service, he was elected on 24 May 1086, taking the throne name of Victor III, but his consecration did not take place until 9 May 1087 owing to the presence of the Antipope Clement III in Rome. 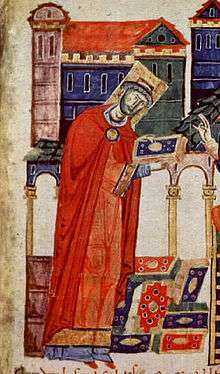 After celebrating Easter of 1087 in his monastery, Victor proceeded to Rome, and when the Normans had driven the soldiers of the Antipope Clement III (Guibert of Ravenna) out of St. Peter's, he was consecrated and enthroned on 9 May 1087. He only remained eight days in Rome and then returned to Monte Cassino, though with the help of Matilda and Jordan, he took back the Vatican Hill. Before May was out he was once more in Rome in answer to a summons for the countess Matilda of Tuscany, whose troops held the Leonine City and Trastevere, but when at the end of June the antipope once more gained possession of St. Peter's, Victor again withdrew at once to his Monte Cassino abbey. 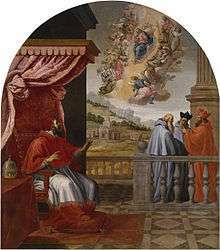 In August a council or synod of some importance was held at Benevento, which renewed the excommunication of the antipope Clement III and the condemnation of lay investiture, proclaimed a kind of crusade against the Saracens in northern Africa and anathematised Hugh of Lyons and Richard, Abbot of Marseilles. When the council had lasted three days, Victor became seriously ill and retired to Monte Cassino to die. He had himself carried into the chapter-house, issued various decrees for the benefit of the abbey, appointed with the consent of the monks the prior, Cardinal Oderisius, to succeed him in the abbacy, just as he himself had been appointed by Stephen IX, and proposed Odo of Ostia to the assembled cardinals and bishops as the next pope. He died on 16 September 1087 and was buried in the tomb he had prepared for himself in the abbey's chapter-house. 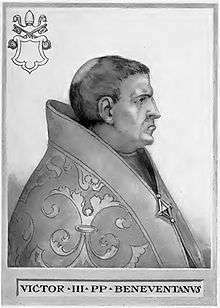 His successor was Pope Urban II. Victor's only existing literary work "Dialogues," is on the miracles wrought by St. Benedict and other saints at Monte Cassino. There is also a letter to the bishops of Sardinia, where (since circa 1050 brought under Pisan and Genoan control) he sent monks while still abbot of Monte Cassino. In his "De Viris Illustribus Casinensibus", Peter the Deacon ascribes to him the composition of a "Cantus ad B. Maurum" and letters to King Philip I of France and to Hugh of Cluny, which no longer exist. 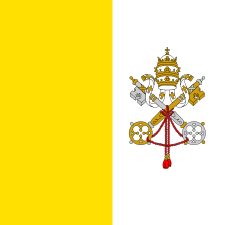 ↑ "September 16 - The pope who exacted tribute from the Mohammedan ruler of Tunis". Nobility. 15 September 2011. Retrieved 2 June 2015.